Prof Ian Poxton, Medical Microbiology, University of Edinburgh Medical School is leading a group (Leonie Hunter, Lynsey Garrett and Bob Brown) investigating the role of toxigenic Clostridium species as the cause of EGS. In particular, this work is concentrating on the association of Clostridium botulinum type C, a type of this highly neurotoxic bacterium that is predominantly associated with wild and domestic mammals and birds. 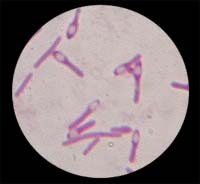 It is hypothesised that this organism is a normal component of the microbiota of the gastrointestinal tract of horses. In the healthy horse it is carried harmlessly, being controlled by the local gut immune system. The presence of antibodies both to the type C neurotoxin and the bacterium itself have been detected in the gut, in the systemic circulation of normal healthy animals, and in the colostrum and milk of lactating mares. Disease is thought to be triggered by a change in a nutrition, which is followed by either the number of C. botulinum type C organisms increasing vastly and/or there is a massive production of toxin within the gut: the horse’s immune system is unable to cope. In other words EGS is a toxicoinfection by C. botulinum type C. A recent study of 30 horses with EGS and 77 controls showed that type C neurotoxin could be detected in 74% of horses with acute EGS disease, and 67% of sub acute and chronic cases, often in massive amounts, compared to 10% of controls, where the level was usually just above the limits of detection (see Hunter et al Equine Veterinary Journal 1999; 31: 492-499). Current work includes the development of detection methods of toxigenic clostridia by molecular (DNA-based) techniques, detection of the toxin genes, and detection of the bacteriophages (bacterial viruses) that carry the genes encoding the toxins, with the view to being able to learn more of the ecology of the putative causative organism and the aetiology of the disease. For more information contact Professor Ian R. Poxton (tel/fax: 0131 650 3128, or email: i.r.poxton@ed.ac.uk ).